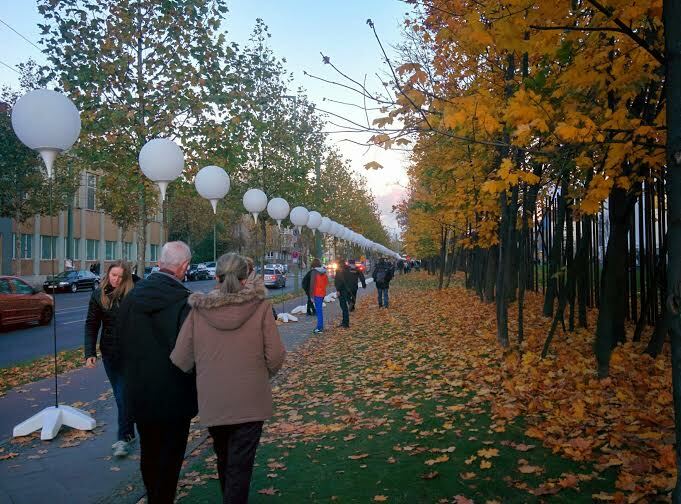 We were fortunate enough to be in Berlin during the November celebrations of the Fall of the Wall, a momentous occasion on the evening of 9th November 1989. 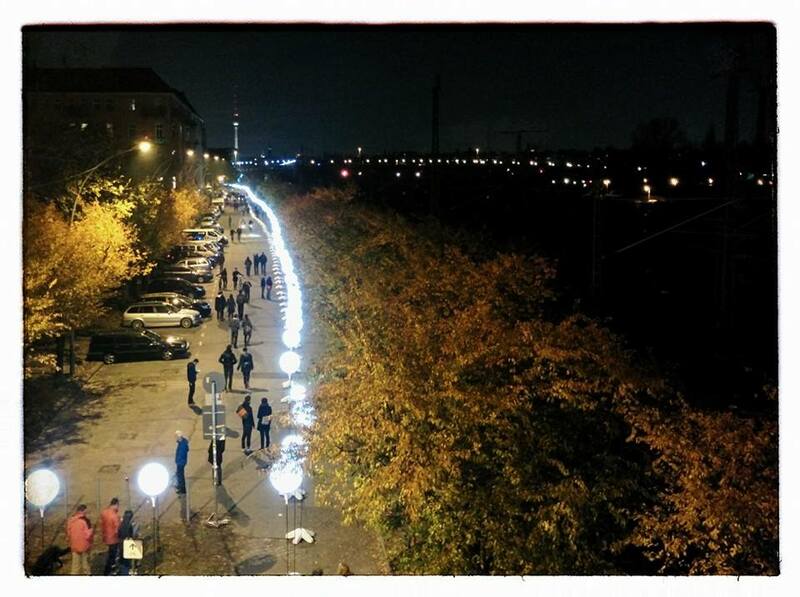 An installation of almost 7000 light balloons was set up along a 15km section of the Mauerweg (path of the wall) across the inner city, weaving its way from the Bösebrücke near Bornholmerstrasse, where the barrier was first crossed, through Mauerpark and up Bernauerstrasse, where a section of the old wall remains, around Nordbahnhof and to the banks of the Spree where the German chancellery buildings stand today, past the Brandenberg gate to Potsdamerplatz, the busiest centre in Europe during the 20’s and 30’s, rendered a wasteland by the war and kept as such by the building of the wall, past Checkpoint Charlie, that famous border crossing between East and West Berlin, and finally right through the middle of ordinary suburbs in Kreuzberg, ending at the East side gallery, the mural-covered section of the wall visited by thousands of tourists each year. 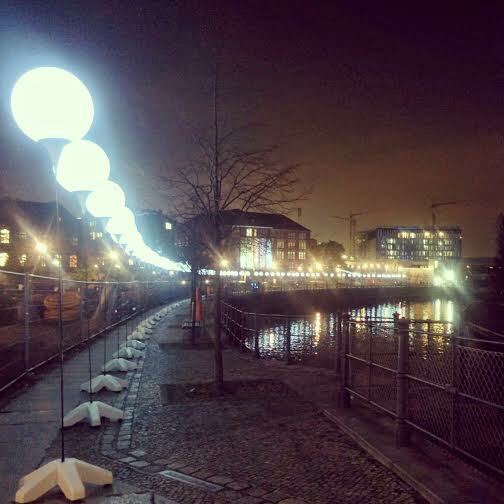 While small sections of the wall remain and its path is still marked around the city, somehow the wall of lights really brought to life how exactly how the city was divided, and what this must have meant for the citizens of Berlin. The wall apparently went up in only a few days, and was not expected. A friend told me her grandfather saw them building and complained a lot about it, at the time they thought he was making too much of a fuss. Later her parents would have to escape by hiding at the bottom of a car, she was born and raised in West Germany as a result. Some of those who tried to leave the East were shot and killed, although many escaped, especially in the early stages of the division. Almost overnight people were cut off from friends and family living on the other side of the wall. When the wall fell, many people drove to Berlin, not only to see the fallen wall for themselves, but also to visit family they had not seen in years. East Germans each received 100 marks “welcome money” – a colleague recalls many of his generation using it to buy a boom box, something you couldn’t get in the East. Shops in Kurfustendam, a popular shopping area in the west, had empty shelves, with people excited to get their hands on items that had been unavailable in the East side. Although the opening of borders and the end of the oppressive communist regime was cause for celebration, the sudden end to the way of life that many people had grown up with and were accustomed to was unsettling for some. 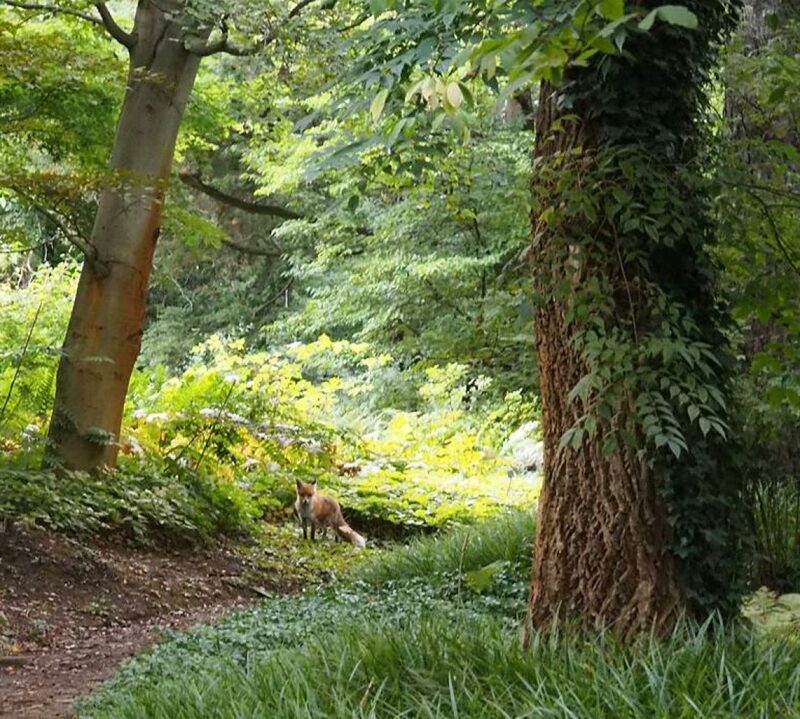 Not everything was bad about the way of life in the East. The really good child care system in Berlin today, which enables women to work without spending most of their salaries on childcare, is apparently the heritage of policies of the East, which favoured the working class. Whether or not the shockingly awful service in Berlin (electricity, telecommunications, heating, rental agencies) comes from the East or the West I don’t know, but this is certainly something that remains to be improved. 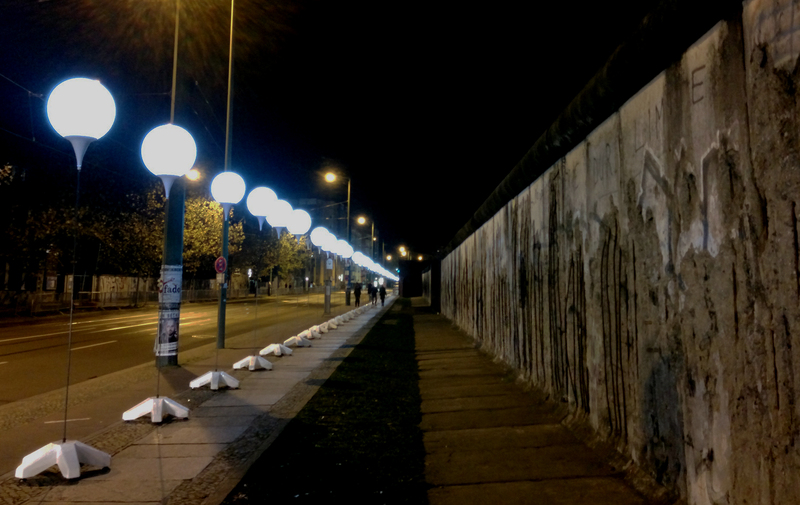 Many interesting, often sad, stories about life during the time of the Mauer were put up along the light wall. We did not anticipate the sheer amount of people that would arrive in Berlin to join in the commemoration and celebrations. 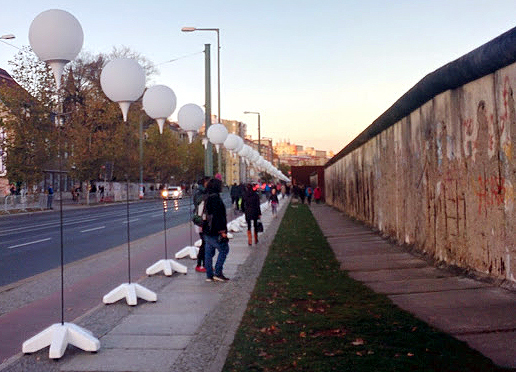 Crowds of people walked and cycled sections of the wall from Friday to Sunday evening, when the balloons were finally released. The atmosphere was unlike anything we’ve ever seen in Berlin before. 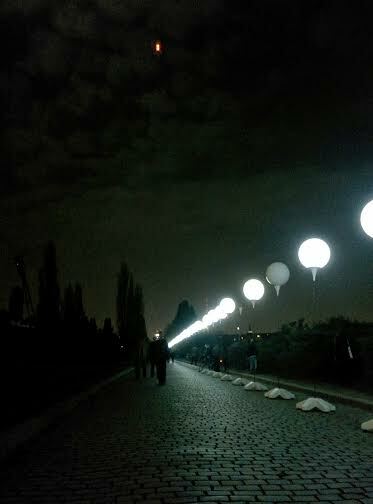 To walk with many others through a lit up, crowded Mauerpark late on a Friday night was something quite special. 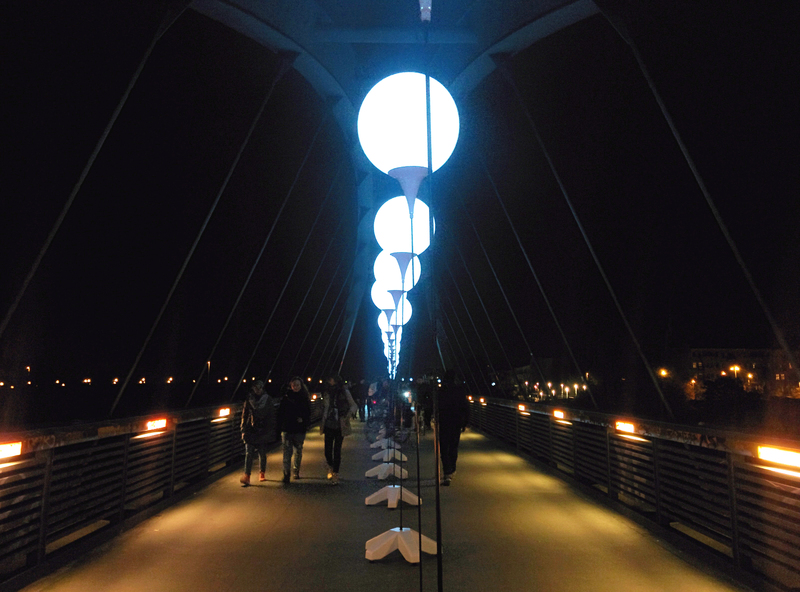 The light wall shows how the city was divided. Bösebrücke near Bornholmerstrasse, site of the first crossing of the wall. 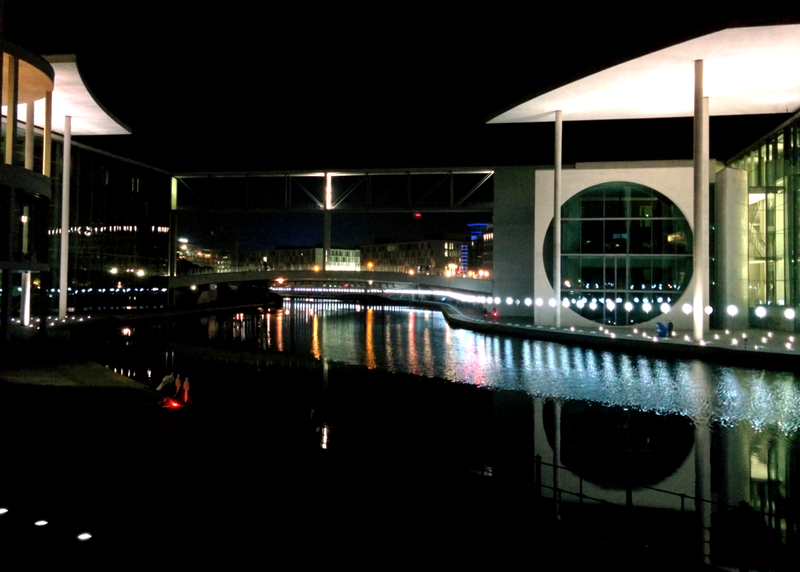 German chancellery buildings on the Spree. On the 17th November was the 25th anniversary of the fall of another Communist regime, this time in the Czech republic. In 1968 the Czech republic was invaded by soldiers from five countries of the Warsaw pact and then fell under Communist rule, following the attempts of the new First Secretary Alexander Dubček to begin the change to a system of social democracy, which was a threatthe Eastern Bloc in the eyes of the Soviets. An unsigned letter asking for assistance, supposedly from the Czech leaders, was waved around by the Soviets to legitimise their occupation. However, it seems that this letter was either fake or written by conservative elements of the government, who had no official right to approve this invasion. Despite international protest, even from communist parties in other countries such as Finland and Romania, Czech remained occupied. By the 1980’s, citizens of countries under communist rule were discontented with their living standards and restrictions, and many countries saw protests. In 1985, the political scene began to change with the introduction of Mikhail Gorbachev’s policies of Glasnost (openness) and Perestroika (restructuring). Encouraged by the fall of the Berlin wall and occurrences in other countries, mass protests and strikes began in the Czech republic on the 17th November, known as the Velvet revolution. In the end the overwhelming of majority of the people calling for an end to the communist rule won out – the Communist party stepped down and the first democratic elections since the Soviet invasion were held in June 1990. Both the fall of the Berlin wall and the Velvet Revolution remind us that a government only controls the people as long as the people believe that they do. In the light of the recent annexation of Crimea by Russia, suddenly 25 years doesn’t seem so long ago.